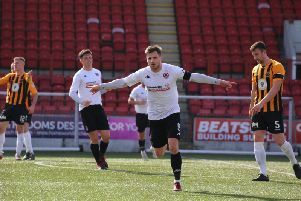 Midfielder Steven Thomson has set his sights on getting Berwick up the table after hitting a hat-trick against Annan at the weekend. Hat-trick hero Stevie Thomson is hoping his goals-inspired win over Annan can help kick-start Berwick’s season and help them climb the table further. Saturday’s treble lifted Rangers to seventh – and afterwards Thomson said: “It’s my first hat-trick, so I’m delighted. “I’ve got 10 goals now, and it’s been a good season on a personal level. “Hopefully, there’s more goals to come. I started off as a sitting midfielder but I’ve moved further forward as my career has gone on. “A couple of seasons ago at Musselburgh I got 24. It’s my first season in the seniors and I’m really enjoying it. I’m making the most of it since it’s come so late in my career. “The way we’ve been playing, you wonder why we’ve been down near the bottom. “It’s frustrating because we know we’ve been playing well. “The problem has been that whenever we lose a goal the heads seem to go down. “It’s hard when you’re getting beat all the time because the dressing-room’s down and everybody’s wondering when we’re going to win a game. Manager John Coughlin was full of praise for his top scorer, saying: “This was a battle we knew we had to win. “It was all about getting the three points and Stevie’s hat-trick was the icing on the cake. Stevie is 31 now and arrived late in senior football. “We signed him from Musselburgh but I have to say he probably should have made the move a lot sooner than he did. He was full of running today. Coughlin added that the important thing now was for Berwick to build on the win. Coughlin says he is still on the look-out to try to strengthen his squad if possible. “We have brought some players in already who we think can give us something different, but that means some players, like Brian Martin, are casualties and he has now been released.